"The grant comes at a critical time in the nursing profession," said Dr. Afua Arhin, Associate Dean of the FSU School of Nursing. 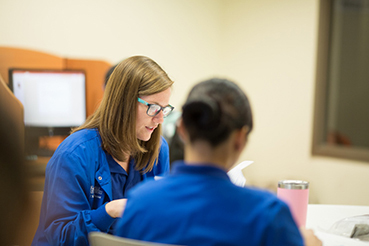 According to a recent Georgetown University report, by 2025, North Carolina is projected to have the second-largest shortage of nurses in the nation - a deficit of nearly 13,000. "Of the 80 rural counties in North Carolina, 70 are currently designated 'medical deserts.' FSU is doing its part to increase the number of BSNs (Bachelor of Science in Nursing) in North Carolina by growing its nursing program. The Golden LEAF Foundation recognizes this important need and is providing $134,200 to FSU School of Nursing to support this growth," Arhin said. The Golden LEAF Foundation is a nonprofit organization established in 1999 to receive a portion of North Carolina's funding received from the 1998 Master Settlement Agreement with cigarette manufacturers. For almost 20 years, Golden LEAF has worked to increase economic opportunity in North Carolina's rural and tobacco-dependent communities through leadership in grants making, collaboration, innovation, and stewardship as an independent and perpetual foundation. The Foundation has provided lasting impact to tobacco-dependent, economically distressed and rural areas of the state by helping create 63,000 jobs, over half a billion dollars in new payrolls and more than 68,000 workers trained or retrained for higher wages. To learn more about the Golden LEAF Foundation, visit www.goldenleaf.org or call 888.684.8404. For more information, call (910) 672-1474 or email jwomble@uncfsu.edu.